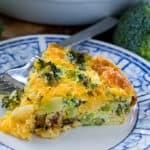 Crustless Broccoli Cheddar Quiche (Low Carb) is a delicious low carb quiche with lots of cheddar cheese and bacon to enhance the flavor of the broccoli. 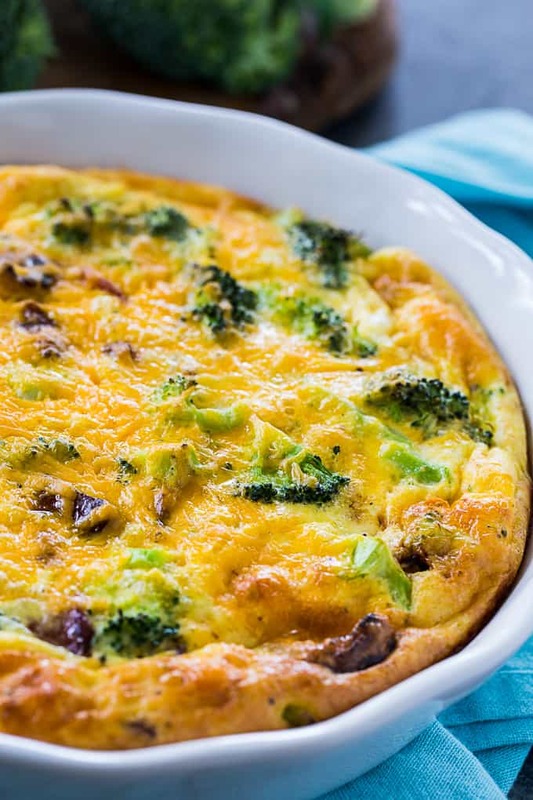 It makes a great low carb breakfast, lunch or dinner and it is keto-friendly and gluten-free. 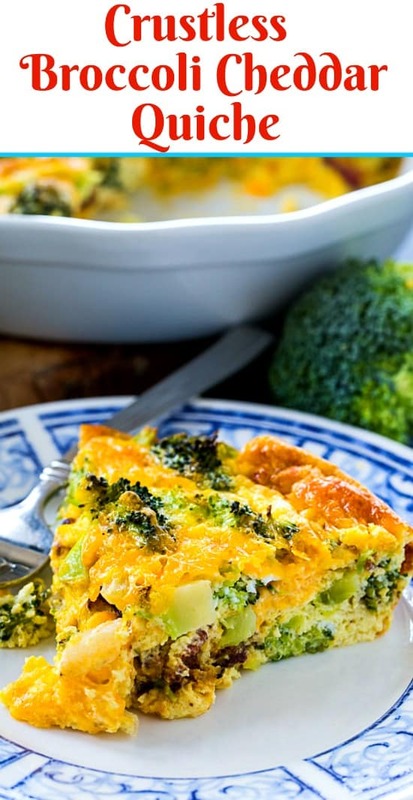 This quiche tastes so rich and creamy and insanely delicious. 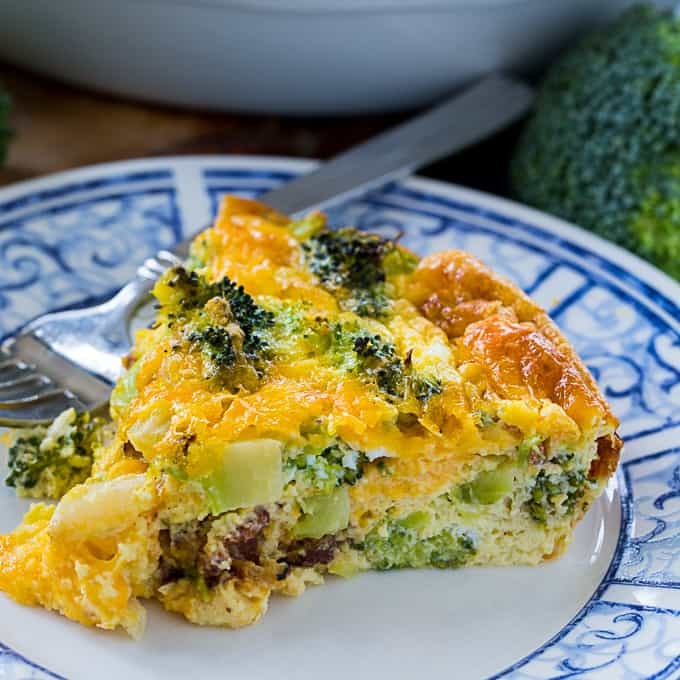 I really do think that cheese, broccoli, and bacon is one of the best quiche combinations. This is such an easy recipe that only takes a few minutes to prep. Leftovers reheat well. You’ll start by steaming the broccoli. You can either do this in the microwave or in a pot with a steamer basket. You don’t want it completely soft since it will cook more in the oven. Just crisp tender. Cook the bacon in a nonstick pan until crisp. Remove it and set aside. Cook the onion in 1 tablespoon of bacon grease until soft. In a large bowl, whisk together the eggs, heavy cream, and milk. Stir in the salt, pepper, garlic powder, broccoli, bacon, onion and cheese. Pour into a greased pie plate and bake for 30 to 40 minutes or until set in the middle. 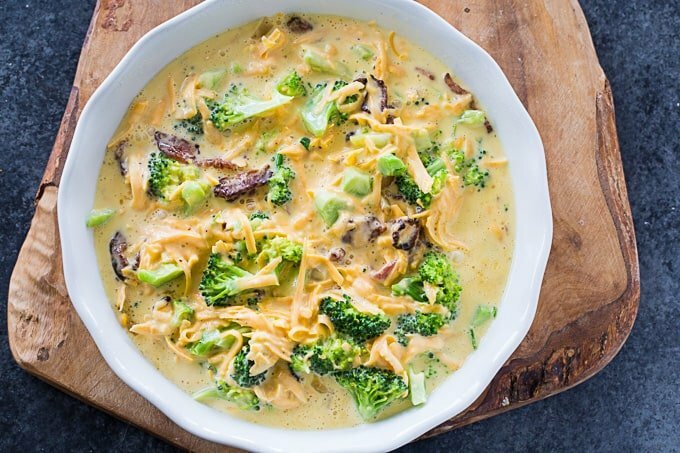 Can You Freeze Crustless Broccoli Cheddar Quiche? Yes- After baking, let the quiche cool. You can freeze the whole quiche or better yet, slice it into pieces and wrap each piece individually. They can be reheated in the microwave. 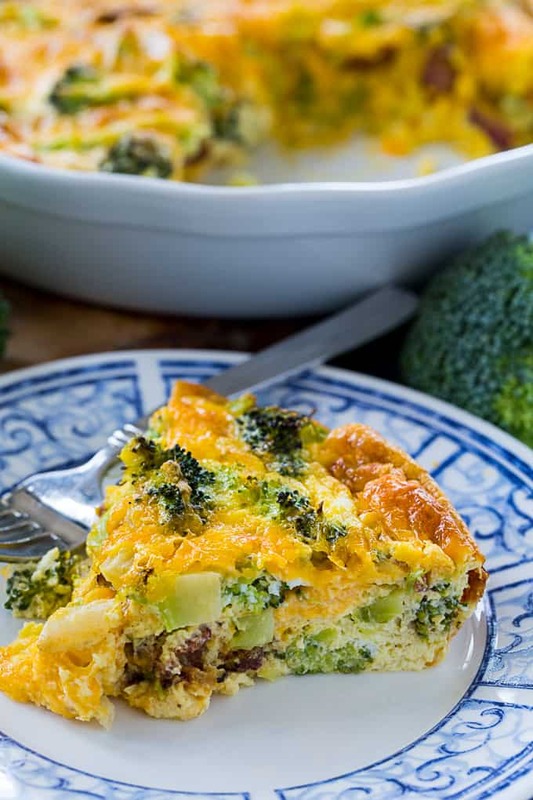 This quiche tastes great warm, cold, or at room temperature. I’ve used all cheddar cheese, but you could sub half the cheddar with swiss or Monetrey Jack. Only 4 net carbs per serving! Preheat oven to 375 degrees and lightly grease a 9-inch pie plate. Cook the bacon in a nonstick pan until crisp. Remove and set aside. Steam the broccoli until crisp-tender. Set aside to cool. Drain off all but 1 tablespoon of bacon grease. Cook onion in bacon grease until soft. Whisk eggs in a large bowl. Whisk in heavy cream and milk. 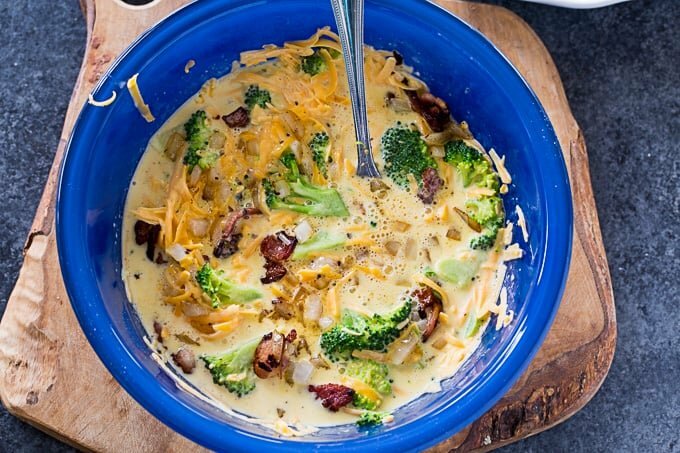 Stir in salt, pepper, garlic powder, broccoli, bacon, onion and cheese. Pour into prepared pie plate. Bake for 30 to 40 minutes, or until set in the middle. Disclosure: Nutritional info is provided as a guide only and can vary based on brands of products used and cooking and measuring methods used.